If you are as grimly fascinated as I am by epidemics and other mysterious disease outbreaks, you may well have heard of Typhoid Mary. Typhoid Mary was Mary Mallon, an Irish immigrant living in New York at around the turn of the century, who became the first person ever to be identified as an asymptomatic carrier of typhoid, the often fatal fever which periodically broke out in the overcrowded, insanitary conditions of the city at the time. This in itself would be interesting enough, but what made Mary famous - or rather infamous - was that she repeatedly ignored warnings about her condition once released from quarantine and continued, under various false pretences, to undertake work as a cook, repeatedly infecting (and consequently killing) people who ate her food. 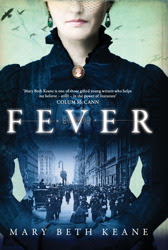 Fever is a fictionalised account of Mary Mallon's life, told largely from her point of view, although to a lesser extent, it is also the story of her infuriatingly feckless partner, Alfred. It's a fascinating tale and Mary Beth Keane builds a vivid picture of New York in the early 1900s, teeming with recent immigrants struggling to better themselves in desperate poverty, packed into tenement blocks, paying to sleep on cots in other people's kitchens, scrubbing clothes in Chinese laundries, selling cheap wooden toys from hired carts. This is a city in which horses that collapse on the job are left to rot in the street and boarding houses cram ten beds to a room and make their occupants share a single chamber pot. Yet at the same time, it's also a city in which a 14-year-old girl, as Mary is when she manages to survive the journey from County Tyrone to Ellis Island, can start her life all over again and make something of herself. Mary is an excellent cook, her skills sought after. It's Mary who supports Alfred, her partner, not the other way round; it's Mary who can save up enough of her wages to buy the very same hat her employer wears. I did at times find it hard to reconcile Mary's intelligence and determination with her relationship with Alfred, with whom, on and off, she lives. Like Mary, Alfred makes repeatedly poor choices, but unlike Mary, his choices are impulsive and ill-considered; also unlike Mary, he lacks determination and pragmatism and has a serious drink problem. I found it hard to understand what Mary saw in Alfred and why she continued to love him - but perhaps we all know someone who seems inexplicably tied to a partner who seems depressingly unsuitable for them. If you already know, as I did, what happened to the real Mary Mallon, the plot of Fever contains few surprises, and in fact, even if you don't, it's pretty straightforward stuff with a rather episodic structure and nothing unexpected. But this is a novel full of atmosphere and crammed with arresting little details about a stage in New York's history that seems strangely out of control - a 'best of times, worst of times' sort of period, full of the excitement of an up-and-coming melting pot of city in which great things are happening, yet at the same time, strangely out of control. Skyscrapers are being built and scientific advances are being made in epidemiology and healthcare, yet at the same time, families are dying in appalling slum housing and working in dangerous sweatshops: among the smart, orderly new architecture of the growing city and its officious bureaucracy, there is a swarming, chaotic poverty for which the spread of a deadly disease becomes an apt metaphor.